My brain is just currently being pushed through a sieve. It kind of is. BUT it's good too. I'm in my last week of a three week long on-boarding/training for a pretty cool job. I had to leave this job when my dad passed away but the company was pretty great to work with and they let me join in with the current training class. I'm very grateful for that and I actually really like what I'm learning. So, even though it's a lot, it's all good! It was a Scarecrow. So, watch for the tutorial coming soon. 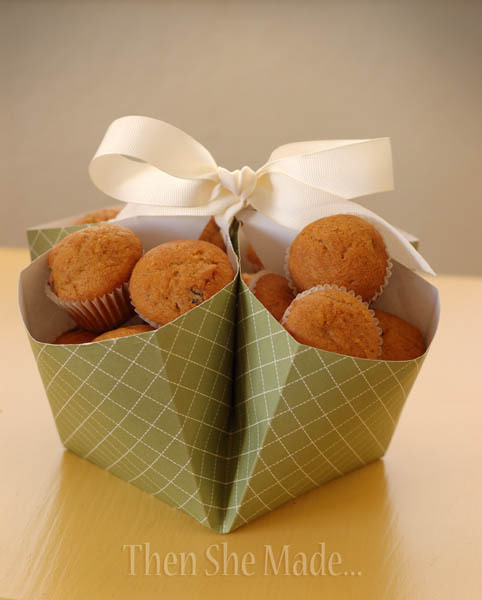 In the meantime though, because it's fall, and pumpkin everything is on my mind, here's my favorite Pumpkin Muffin recipe and I've included the link to the fun little paper basket tutorial, too. That way you can make the muffins and share them because, well, that's nice. And being nice is awesome! In large mixing bowl beat eggs, sugar, pumpkin, vanilla, and oil until smooth. Mix in dry ingredients and fold in chocolate chips. Fill muffin pans and bake at 375 degrees for 15 - 18 minutes. You can make these regular size or mini, I prefer them mini because I think mini is cute! Ya, forget that they are yummy or that some people think bigger is better, visually the mini muffins are just cute. Ok, enough said, go make muffins. 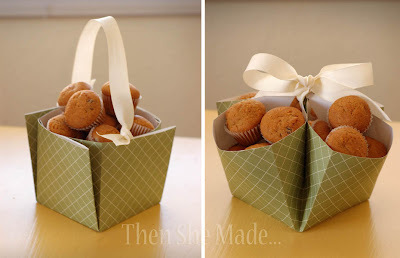 And, when you get them made put them in this cute paper basket and go deliver to someone who needs a nice treat! Wonderful gift for the coming holidays! Shared and waterlogged! Thanks for sharing this with us! Perfect timing! Glad you're back! I checked your site a couple of times thinking I'd missed my email update!